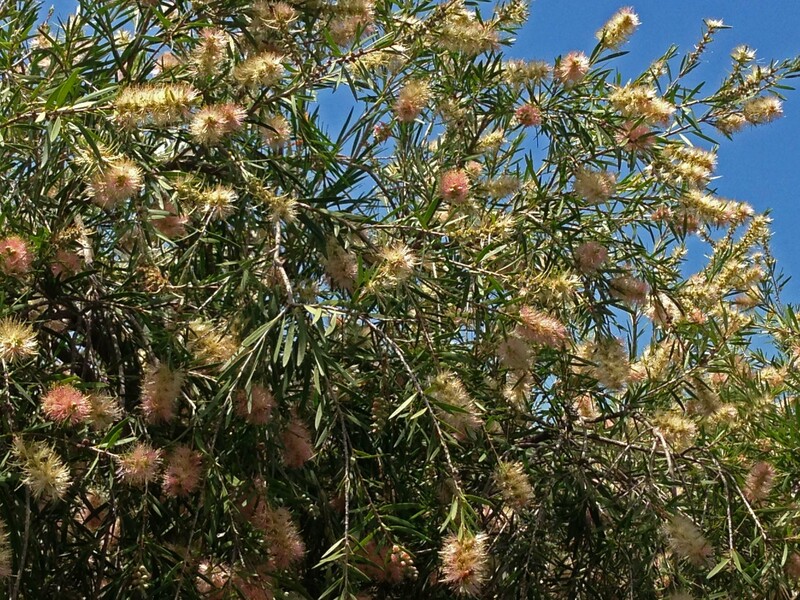 Mum and I were having a walk around the garden checking out all the growing things when we passed the callistemon bush that grows on the edge of the lookout. I’d been seeing the flowers from a distance but it wasn’t until we were up close that I realized it was amazingly alive with insects feeding from the cascades of pink blossoms. We have about ten or so callistemons in the garden, but the rest are red and flower in the spring. Possibly they’re all the Captain Cook variety. I watched the one near my veggie garden for hours in October, trying to identify the bees and hoping for a blue-banded one (amegilla cingulata). 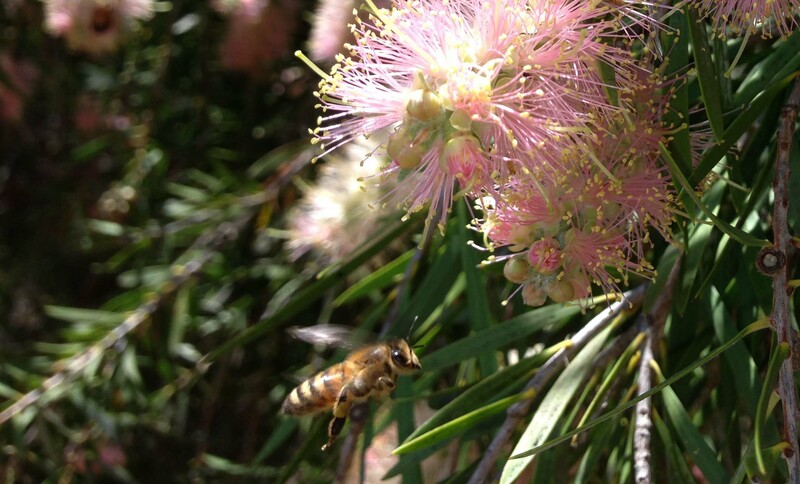 There were always a lot of the European honeybees (apis mellifera). 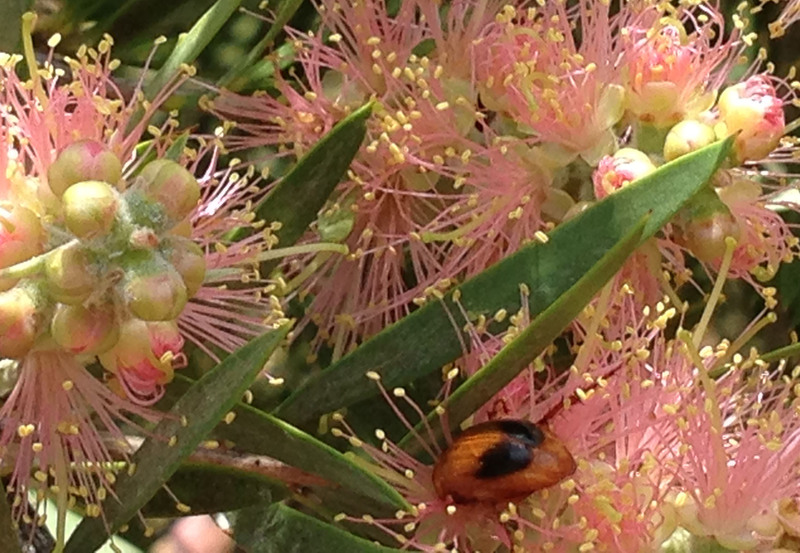 On this callistemon, in summer, I saw insects I’d never seen before anywhere. There were lots more beetles for a start. As I didn’t have names for them I mentally recorded them as “the spectacular multicolored one”, “the thing with wings”, “the gargoyle” , the “domino beetle” and so on. In addition to the large obvious nectar feeders, there were lots of tiny black wasps and native bees (I think) too small for me to photograph. 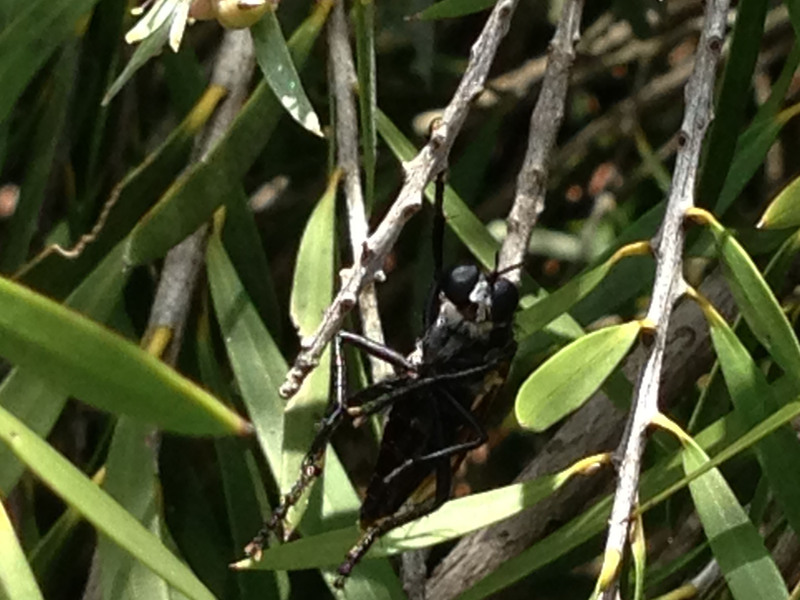 The Gargoyle – a type of large completely black wasp? It puts its wings up to feed as the wasps do. 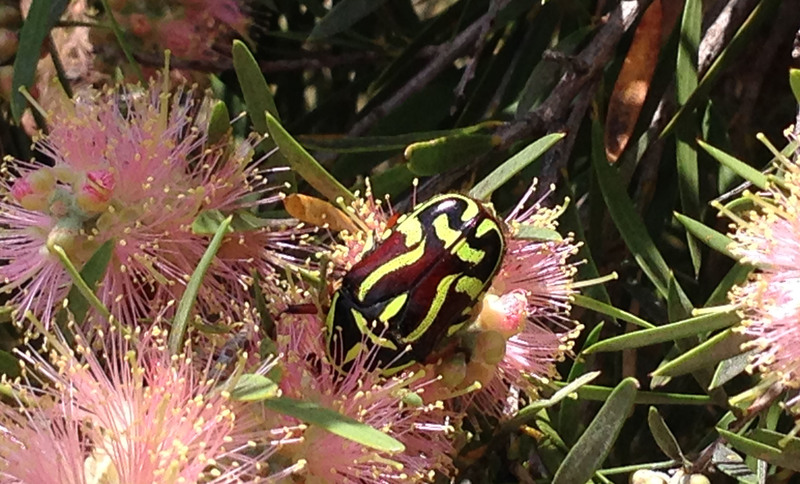 Polystigma Punctata (punctate flower chafer). I still think my name “domino beetle” is better. There were many types of wasps, possibly some of them paper or potter wasps that have been making nests around the edge of the verandah and even in doorways. 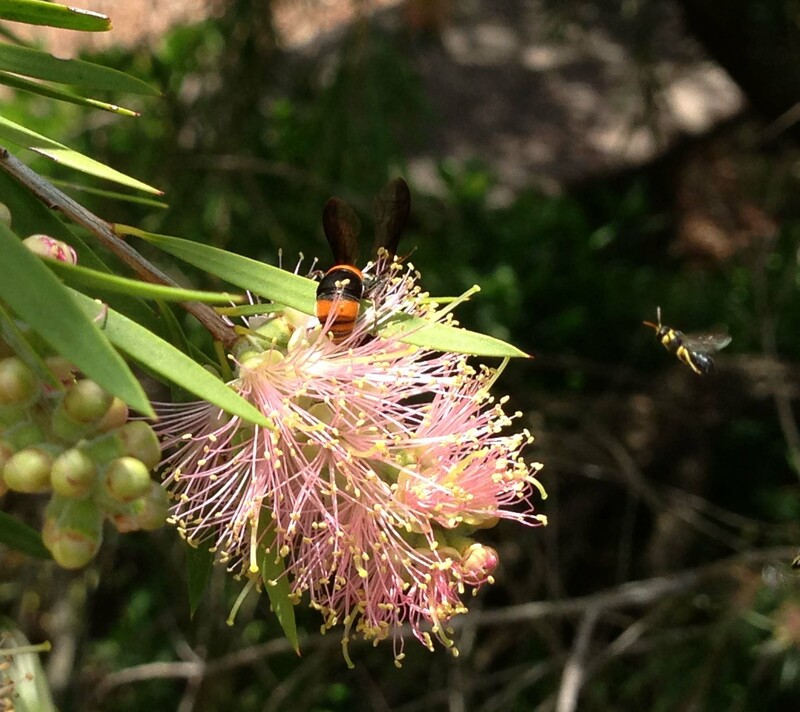 Possibly Ebispa Ephippium (potter wasp) with a tiny other bee or wasp flying in beside it. I’m really excited to see so many types of wasps feeding, after reading about the parasitic wasps that help protect us from all sorts of pests, like Christmas beetles. 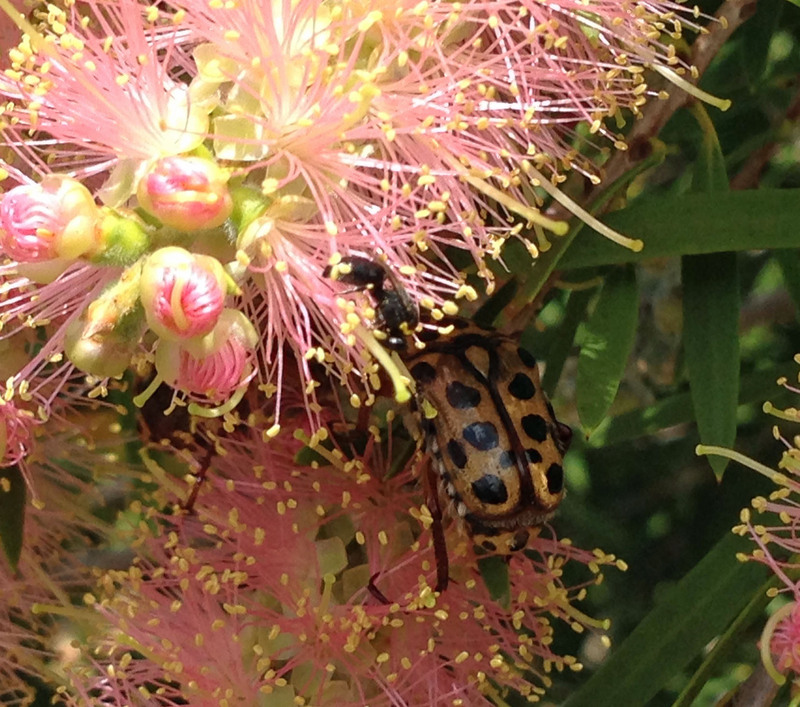 I thought it was an interesting example of native shrubs bringing in helpful insects that otherwise don’t bother with our garden of introduced plants. While I was photographing, the wind came up and started blowing the blossoms around annoyingly. In the moments where the wind was still I tried to catch the motion of some of these thousands of individuals all coming and going to the same shrub. Some were clearly keeping an eye on me. Big, black, thing, watching me. great pictures! the ‘thing with wings’ looks like a stiletto fly (Therevidae). 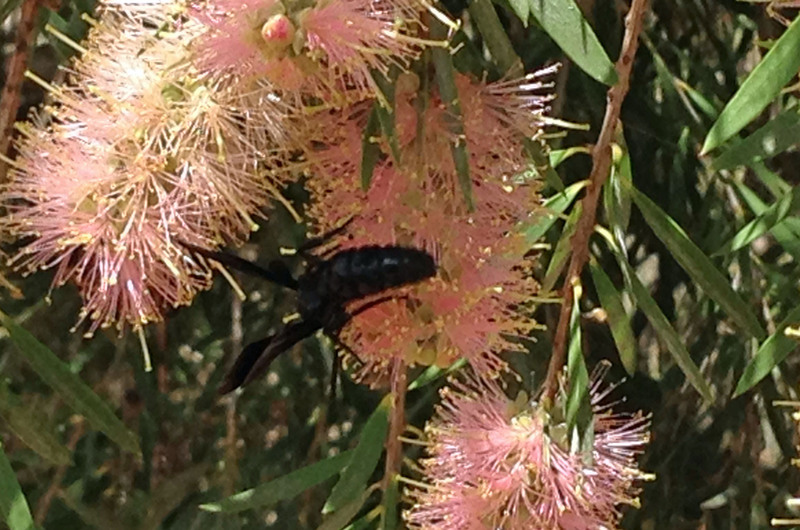 Australia apparently has the world’s richest stiletto fly fauna, but very little is known about their ecology. I think they’re gorgeous, they can be easily mistaken for wasps! Thank you. Critters is the word. I was really gobsmacked at the variety, and in such a convenient location. It certainly reminded me what a resource the native flowers are.